Plastic trash is a serious problem. It is a fact. Every year more plastic bottles are manufactured than recycled, and it takes 5 to 6 decades for most plastic bottles to decompose. Decomposition for some types of plastic takes much, much longer. 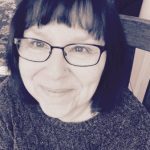 Why not help the planet and have some fun while you are at it. 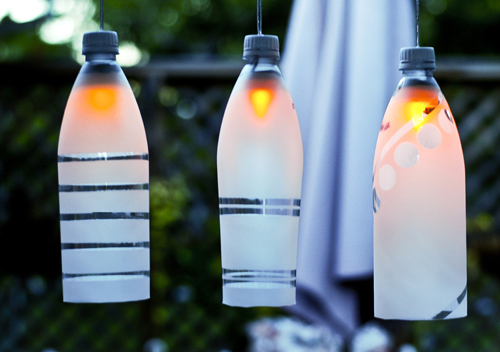 Recycle plastic bottles into cute party lights. It isn’t tough and can be made in less than an hour. 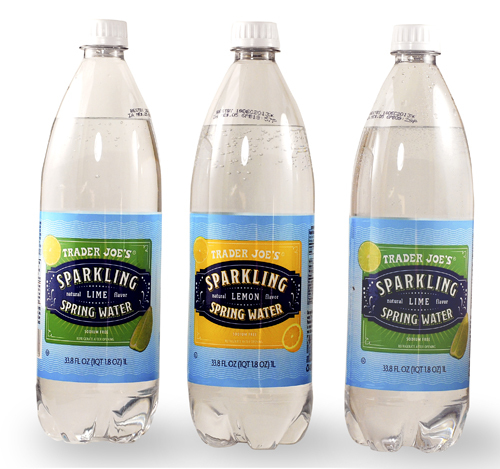 As you can tell by the photo above, I like Trader Joe’s sparkling spring water, but you can use any plastic bottle that is clear and has a smooth surface. Plastic bottles have manufacturer codes printed on them. The print is unattractive but is easily removed with a tiny bit of Goof Off. That stuff is magic!! The next step is trimming the bottom of the bottle to form the shade. 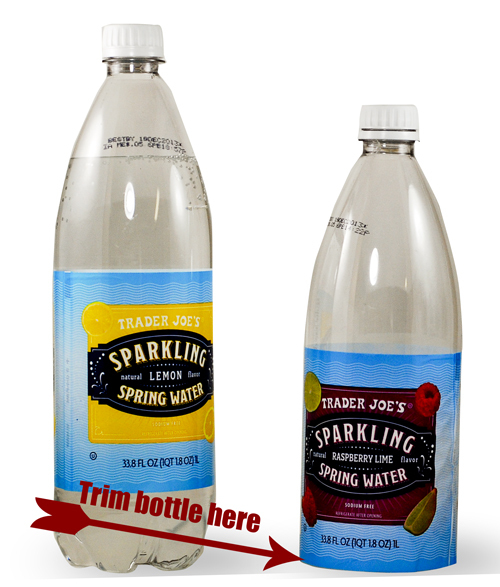 If you are using Trader Joe’s Spring water bottles, use the bottom of the label as a cutting guide. If you are using another type of plastic bottle.you can wrap it with painters or masking tape, and use that as a cutting guide. After the bottles are trimmed, you will have to decide what areas of the bottle will remain clear. 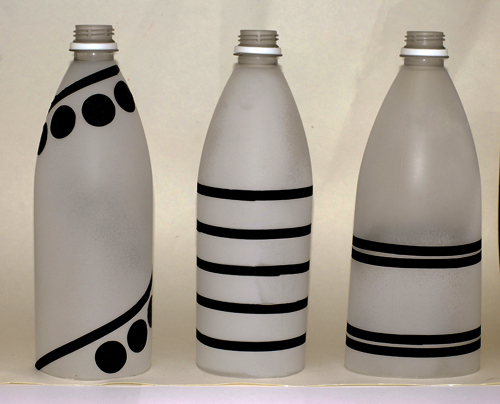 Cut your designs out of vinyl or contact paper and place them on the bottle. I used contact paper and cut the designs with my Pazzle Inspiration die cutting machine. I had no problems with cheap old contact paper on my die cutting machine. It worked so well that I am going to make wall art next out of the left over contact paper! You can also use scrapbooking punches, scissors Xacto knife, etc. to block out shapes on the plastic. 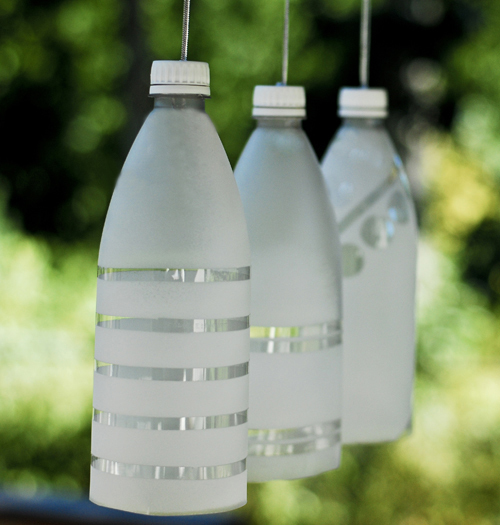 After you have determined your design for your party light, the bottles are ready to be sprayed with frosting spray. I used Valspar glass frosting spray because it can be used on plastic. Valspar sprays are sold at Lowe’s hardware. Make sure to check that your frosting spray is compatible with a plastic surface, as not all frosting sprays are. Take precautions when working with aerosol products. Always spray outside or in a well-ventilated area. 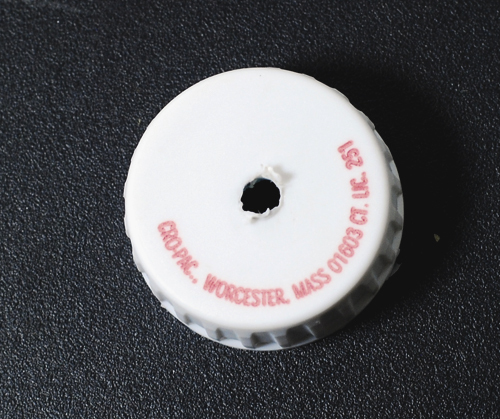 Drill a hole into the bottle cap, and run a cord to hang up your light through it. Screw the cap onto the bottle top. Battery operated tea lights work best with plastic bottles. Plastic bottles will melt and are dangerous when used with candles or electric light bulbs. Always be safe, and use common sense with luminary type craft projects. 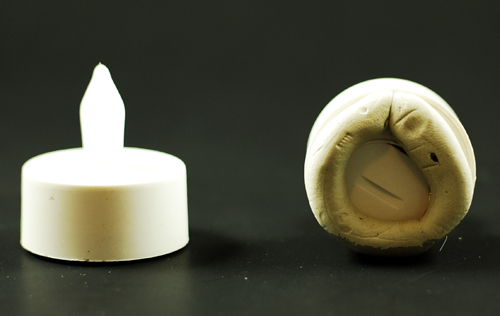 Roll out Duck Brand Removable Mounting Poster Putty, 2 oz., White (1436912) and attach it to the bottom of a battery operated tea light as in the picture above. Place the tea light upside down into the plastic bottle press down firmly. ( Make sure to turn you tea light on) The tea lights are easily removed when you are finished. The lights look pretty both in the day and at night. They add ambiance to your gathering, and help our planet at the same time.